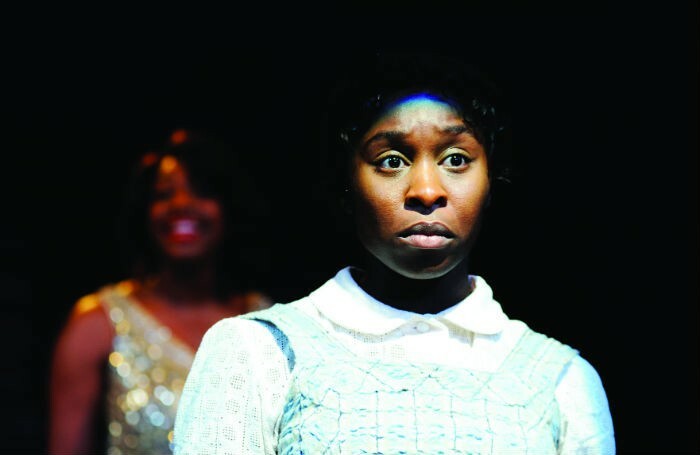 Last week Cynthia Erivo officially arrived on Broadway to reprise the role of Celie in John Doyle’s production of The Color Purple that she originated at the Menier Chocolate Factory in 2013. And overnight, she became a Broadway superstar – co-starring with the Oscar-winning Jennifer Hudson but blasting her into the shade. To those who question why a revival of The Color Purple is back on Broadway after its predecessor closed there only in 2008, the answer is two words, and it may not be the two words you expect. Cynthia Erivo. She is an absolute marvel in the lead role of Celie, playing her at first with defeated deference, then indignation and then righteous might. Her voice lifts the roof off the Bernard B. Jacobs Theatre. There are times you forget Jennifer Hudson also is onstage. Meanwhile, Ben Brantley actually jumped the gun on his own review for the New York Times last week by including the production in his Top 10 round-up of the year’s best shows, two days before it actually opened. In his advance report in that round-up capsule, he called it, “A makeover made in heaven. The director John Doyle has slimmed down, toned up and retailored a show that seemed leaden and garish in its original Broadway incarnation 10 years ago.” and referred to “the bonus of a star-making performance from Cynthia Erivo and blissful support from Jennifer Hudson and Danielle Brooks. The greatest joy of all, at least for longtime believers in theater mythology, is the ascendancy of Ms Erivo, who was very good when I saw her in London but is even better here…. By the production’s end, Celie has developed a muscular voice that reaches to heaven, and Ms. Erivo has emerged as a bona fide star who lifts the audience to its feet. For once, the word ‘revival’ is apt: Doyle’s intervention amounts to a kind of theatrical CPR, restarting the heart of a show that, in its original production, seemed to die before your eyes… Of course it takes actors who have the subtlety to work at this level, filling in the blanks that a fuller production might distract you from with sets and winks and all manner of overemphasis… Erivo, who also starred in the London version, proves especially masterful at calibrating the gradations of Celie’s emergence… By the time she gets to her 11 o’clock number – which, thanks to Doyle’s cuts, is really at about 10:25 – you may feel you have seen as great and full a transformation as any previously put on the musical stage. You may feel that way about the show, as well. Genuine showstoppers rarely happen in the musical theater, especially in the middle of an act. But when they do, something happens – maybe to the air pressure in the lungs of theatergoers – which seems to buoy whole groups of disparate audiences to their feet. It happened at a recent preview of The Color Purple and, chances are, it’s happening every night. Before she left for Broadway, they also recorded a brilliant brand-new album of Alan’s work, co-starring with the wonderful Oliver Tompsett. One of those Hippodrome nights was turned into a birthday celebration for me, as I’ve written here, and I was brought onto the stage for a finale in which Erivo held my hand and sang directly to me. It was utterly extraordinary. But you don’t need a birthday to feel it: I think she has direct access to my heart(strings) with every performance she ever gives. Watching this swirl of twaddle is like witnessing a drunk trying to set fire to an ice cube. How did it happen? Most theatres have a professional filter, a ‘literary manager’, who ensures that duds are rejected on arrival. If the NT is reluctant to advertise the vacancy perhaps this column can help initiate the search. Applications should be sent to a chap called Rufus Norris. I can’t wait to read Evans’s review of Norris’s production of Wonder.land, which even I disliked last week; though being ever the contrarian, I suspect he may actually like it. And in another instance of critics mauling each other, Mark Fisher (who has written a book about how to be a critic) has replied to my column last week about the authority, or otherwise, of online noise, to which of course the irony is that my column itself appears online. I wasn’t saying that the medium itself (online) is the problem, just that there are now evidently more voices available online, whether from those print sources putting their content online or other independent critics writing only there, and that not all voices are equal: some voices will necessarily rise above it. It’s a democracy in the same way that Twitter is – you’re only as good as your tweets, and your Twitter following will be a direct translation of that. Good voices, I was saying, are necessary to rise above the clamour – and they will. But of course this was taken as a provocation (to use Fisher’s own word in a tweet) in which he drew attention to my piece) to the army of bloggers out there that their words were less valuable than that of the traditional (print) media, and they trolled me a bit. What I was actually writing about was whether we can tune out the noise of early preview reviews when we come to write formal (or officially solicited and/or commissioned) reviews at the ‘proper’ time (when we’re actually invited to do so), and there hangs, I suppose, the key distinction between acknowledged critics (who are invited) and unacknowledged ones (who could be anyone). Never mind. Fisher has now replied in a formal column of his own, to which Ian Shuttleworth, joint lead theatre critic for the Financial Times, has joined the conversation. Yes and no. The “no” is that that proposition presupposes that the best interests of theatre are the business, even the duty, of those who write about it. Part of the foundation for the critical detachment Mark Shenton speaks about arises from the fact that professional (in the sense of paid for by others) reviewers aren’t citizens of the world of theatre. We may care passionately about it – i.e. those best interests may be a major concern of ours – but our *duty*, our *function*, is to communicate with our readers/listeners etc; we’re citizens of the world of journalism or of academia, not of theatre… What online self-publication has done, concomitant with removing formal definitions of professionalism, is to dissipate that sense of detachment, of being outward- rather than inward-facing as regards theatre. We are still so much in the early days in the way that the internet works – but eventually I believe there will be a shake-out and a hunger for vetted, authoritative journalism. It’s very much in flux and it is hard to predict at the moment what is going to happen. I feel very lucky to actually have a forum and a job. But there have always been critics, since the Athenians, so I assume will be always be some sort of market for it. It’s just that we’re in the twilight of a certain tradition of it.